Are you tired of waiting for your carpets to dry after having them cleaned? Heaven’s Best offers excellent carpet cleaning that dries quickly in Birmingham AL, so you can get back to your life in no time. Have you ever had your carpet cleaned and after the cleaner left the carpets were soaking wet and you could not walk on them or let your kids play on them for hours or even days? If so, you are not alone. And, if you got tired of waiting and started walking on them while they were still wet, it probably did not help matters. In fact, you probably ended up tracking new dirt onto them that stuck and made them dirty very quickly after they had just been cleaned. This was not your fault! It was because the carpet cleaner did not properly extract all the water out of your carpet. You should not have to wait this long for your carpets to dry. Heaven’s Best Carpet & Rug Cleaners uses a low-moisture process that will thoroughly clean your carpets and rugs so they will dry very quickly, in about 1 hour. We do not use as much water as other carpet cleaners, but we use professional strength cleaning solutions that will clean and deodorize your carpet. Along with our cleaning solutions ability to work extremely well on dirt, they also are environmentally safe. You do not have to worry about breathing in chemicals that will harm you, your children, your pets, or your elderly parents. Our carpet cleaning products and our process are both healthy and safe for your family. You also do not have to worry about mold or mildew starting to grow under your carpet from excessive water being left in your carpet. We don’t over-wet your carpet. If you want a fast, friendly carpet cleaning service that will clean and deodorize your carpets, and you can get back to your life and activities very soon afterwards, call Heaven’s Best today at (205) 618-9150. We offer convenient friendly services and try to work around your schedule. We will even clean on a Saturday or Sunday if that is the only day you can do it. 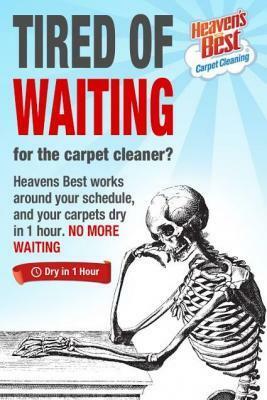 You can’t beat Heaven’s Best Carpet Cleaning that Dries Quickly in Birmingham, AL. Call us Today!